My barber had a mullet. 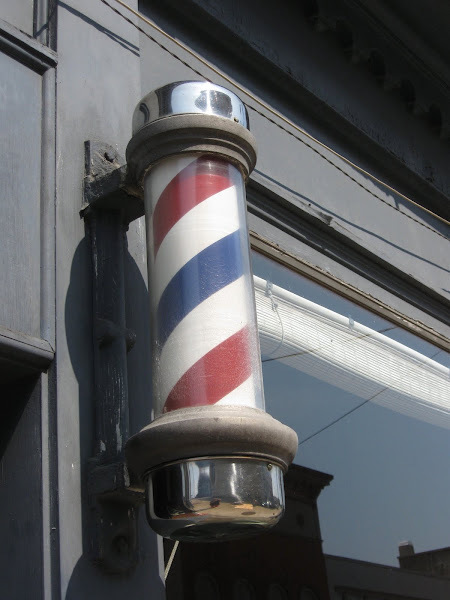 I picked the barbershop because it had those old-timey colorful swirling poles out front. On my way in, I nodded at the guy sitting out front. He did the little Indian head wobble. I’m still not used to that. It’s a completely neutral expression. He wasn’t nodding that I should come in, he wasn’t making any value judgement about my existence, he was just letting me know he registered my nod. It can be unsettling. I walked on by and sat down in the furthest chair, where a beefy Indian man with a mullet hovered. He was alright. Trimmed the areas I wanted, gave me roughly the length I asked for (last time I went to an Indonesian barber and asked for “three centi” he left me with three millimeters), and even nipped the random patch that grows above and to the side of my left eyebrow with the straight razor. He clipped my nose hairs. But when I leaned forward to stand up, he pushed me back down into the chair. My haircut experience was just starting. He held a bottle upside-down a foot and a half above my head and squeezed with one hand, massaging the oil into my hair with the other. He did this longer than I thought the contents of the opaque white bottle should last. He switched to a purple bottle briefly, which made me smell all pretty, before returning to the first one. All the while he massaged my head, squeezing down the back of my head into a V at my neck. Then he used both hands, pushing his palms together until I thought the top bit of my skull would blow open. After a bit of that, he started yanking on my ears. First he’d pull the top down, leaning in close so he could hear the unnatural *squish* noise it made. Then he’d pull the lobe up. It hurt. I think my ears are made differently or something; it felt like he tore something along the top where it attaches to the rest of my head. I knew the next move. They do it in Indonesia too – put one hand on your jaw and the other on your temple and pull suddenly until your neck cracks. I waved my hands in front of me. “No. No need. OK. No.” He just did the head wobble and said, “Free free free free free free.” He drowned out my protests. “Free free free free free free,” and *yank*. It didn’t hurt till the next day, when my entire upper torso and neck hummed with a low pain. I paid — about 5 USD — and left. I couldn’t wear my helmet on the way back because there was too much grease in my hair, which I eagerly rinsed out in the shower, strings of glob down the drain.